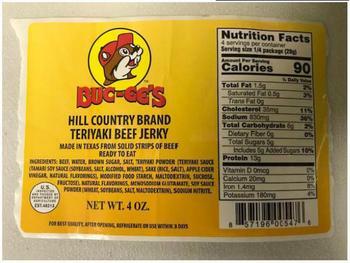 Junior’s Smokehouse Processing Plant of El Campo, Texas, is recalling approximately 690 pounds of ready-to-eat teriyaki beef jerky. The product may be contaminated with extraneous materials -- specifically pieces of hard metal. The recalled product, bearing establishment number “EST. 48213” inside the USDA mark of inspection, was shipped to retail locations in Texas. Consumers with questions about the may contact Scott Chambers at (979) 533-3544.